Not all thoughts are necessarily what you might call your own. Our brain is as much a receiver as it is a generator of thought forms. It is also the receiver and processor of sense impressions and flashes of inspiration. 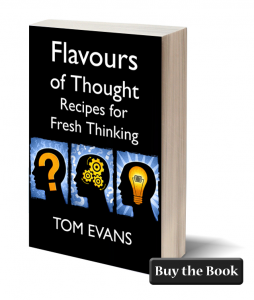 Flavours of Thought is a book on mindfulness not quite like any other. Indeed, it’s really about mind-full-ness! It is a contemporary deconstruction and exposition of the true meanings and messages contained in the Major Arcana of the Tarot. Each key of the Tarot describes a mode of human thought. This book also contains real magic in the form of modern day spells (called Recipes) that really work to improve your life beyond all recognition. It is therefore a book of transformation. Part 11 of the book, Recipes for Fresh Thinking, then shows how these 21 flavours can be combined into 28 sample recipes (there are billions of other permutations) to tackle common issues like self-anger all the way through to finding your soul path. This second edition now includes seven new Chef’s Special recipes and a new Part 111 on Practical Floughtology. This new section shows you how to concoct your own recipes and contains sample recipes you can use in business and to create abundance.